Earlier today, ZUK (a Lenovo subsidiary) announced the Z2 Pro, a high-end Android smartphone that features a Snapdragon 820 CPU and up to 6 GB of RAM. According to GizmoChina, while presenting the ZUK Z2 Pro, Lenovo CEO Yang Yuanqing also talked about an upcoming Motorola handset (as you may know, Lenovo bought Motorola Mobility back in 2014). 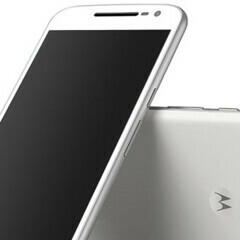 Reportedly, Yang Yuanqing confirmed that an "exciting" Motorola device will be unveiled on June 9. Unfortunately, the Lenovo exec didn't elaborate on the subject. Recently, we heard about several Moto handsets that could be announced soon, including the Moto X3, Moto G4, and Moto G4 Plus. The Moto G4 showed up in various leaked images, and it seems that it has a fingerprint scanner on the front. However, we don't know if "exciting" is a word that could describe a new Moto G, since this will, most likely, be a mid-range handset at best. So we're thinking that Yang Yuanqing was talking about a new Moto X. Then again, a mid-range phone may be exciting if it offers lots of attractive features at a very low price. It's been almost 6 months since Motorola last announced a new smartphone (the Droid Turbo 2), so the company certainly had time to work on new (and hopefully great) devices. We'll be here to let you know when we have more details about this. Moto lost my interest with the "updates" over the last year. Moto had a fighting chance when it was with Google. It felt like the best of Google was going to be brought to fruition from Moto but now they lost my interest with their piss-poor slow updates. Slow updates? Aren't they like second place behind google themselves for firmware updates on android versions? And for the exciting phone...I don't feel it'll be THAT compelling. Hope im wrong. true, moto's UI is almost stock afterall..
Moto X Pure was the last great Motorola. The Motorola phones directly from Motorola had fast updates. I feel sorry for people who buy carrier branded phones. Something about owning a Lenovo phone is not compelling. Piece of crap? Motorola X Pure was brilliant and it was released back in september 2015. Lenovo owned Motorola since 2014. I do not hate motorola infact i really wanted to own one. But the recent leaks has heen really dissapointing to me. I am sure lenovo will screw up motorola in no time. lenovo has ruined the last of what used to make moto great. How do you guys feel about Lenovo changing the screen to 5.5" for the G, and 5.0" for the E?